Happy Tuesday morning to ya! Oh and Happy New Year’s Eve too! My week hasn’t been off to the best start, but I’m trying to just stay positive – no one wants to be a pouty party pooper on New Year’s! I woke up yesterday morning feeling pretty icky. I had to get up for Jazzercise at 5 a.m. and could immediately tell that it was going to be a rough day. 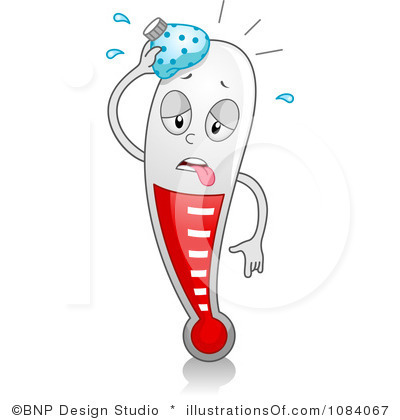 Thank you google images for all the lovely ‘fever’ clipart. HA! I had a lowgrade fever of 99.6 before heading out to teach class. I didn’t feel terrible, but I didn’t feel awesome either. SO I went ahead and taught class to the 2 ladies who showed up. I made it through our workout fine but with a little lower intensity than normal. By the time I made it home, showered, and to my office for the day, I knew it was going to be rough. My fever had gone up to 100.2, and I was feeling it. I know that we are supposed to wait to take meds for a fever until it gets over 101 degrees to give the fever a chance to fight off the bad stuff in our systems. But I couldn’t stand to sit at my desk all day going from blazing hot to chilled and freezing. So I took some ibuprofen to get me though the day. When I arrived home last night, I was definitely sicky-poo and needing some rest. Nick took care of me and got me some Chinese food (egg-drop soup!) that I tried to choke down. I laid on the couch and watched my temp rise up over 100 degrees again, so I took more meds and headed to bed around 8:30 pm. This morning I slept in as late I could before rolling out of bed for the day. My temperature is only slightly elevated today, but the rest of my body still hates me. Why can’t I stay healthy for longer than a couple weeks?! I’m hating this fever/flu-like junk because I can do nothing except drink lots of fluids and rest. And this girl has a hard time resting. It’s amazing how my anxiety rises when I can’t get out and run or teach Jazzercise. Ok enough with the crummy stuff. Onto the more fun items, like what are we all doing for New Year’s Eve?! I hope you have something fun planned! Nick and I were going to play it low key and have a quiet dinner out somewhere and then come home to watch the fireworks on TV with Mac. But now, since I’m feeling under the weather, it’s looking like he might be getting us some more Chinese take out for dinner. 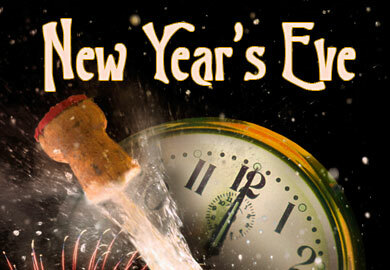 Whatever you are doing tonight, I hope you stay safe and get to spend it with your loved ones. If you are sick like me, be thankful for holiday which gives us a day to rest and relax!